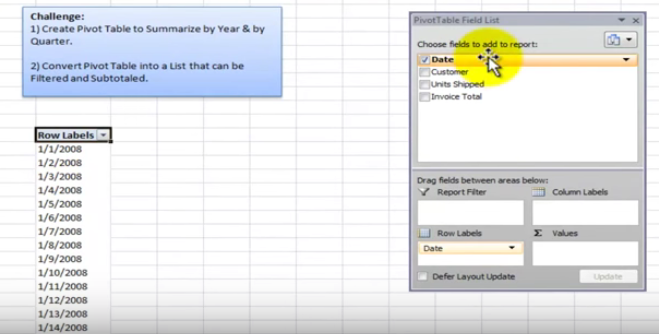 In order to summarize the sales information by year and quarter, first highlight the data and create a pivot table. Then select the Date field. Next, go to Pivot Table Option> Group> Group By Field. Group the dates as Months, Quarters and Years. When the grouping is done, the line items, in this case, “sales per day,” will be grouped under months, quarters and years. Next, remove the dates to leave the quarters and the year on the pivot table. Now you can rearrange the fields and bring in the Customer & Sales data — and see your data in years and quarters. I hope you find this tip useful! Interested in more Excel solutions? Read about a powerful and flexible BI toolset — that you may own and not realize — in the blog, The Best New Business Toolset is Built into Microsoft Excel. Keep in mind, if you would like to use more advanced capabilities in Excel to make an immediate impact on your organization, 8020 Consulting is here to help. Just click on the button below to connect with us.